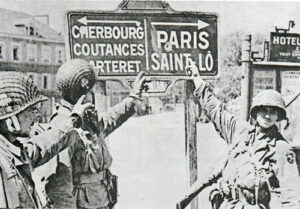 In the ensuing battle, the 101st forced passage across the causeway into Carentan on 10 and 11 June. A lack of ammunition forced the German forces to withdraw on 12 June. When the 101st Airborne entered the town of Carentan on June 12, 1944 (D-Day + 6) after heavy fighting on the two previous days, they met relatively light resistance. The bulk of the surviving German defenders (from the 6th Fallschirmjäger Regiment) had withdrawn to the southwest the previous night after a heavy Allied naval and artillery bombardment. Both sides realized the importance of the city: for the Americans, it was a link between Utah Beach and Omaha Beach, and would provide a base for further attacks deeper into German-occupied France. For the Germans, recapturing Carentan would be the first step towards driving a wedge between the two U.S. landing beaches, severely disrupting and possibly even destroying the Allied invasion. The 17th SS PzG Division counter-attacked the 101st Airborne on 13 June. Initially successful, its attack was thrown back by Combat Command A (CCA) of the U.S. 2nd Armored Division. The severe casualties suffered by the 3rd/502d PIR, estimated at 67% of the original force, resulted in the nickname “Purple Heart Lane” applied to that portion of the Carentan-Sainte-Mère-Église highway.